Now You Can Throw Those Cardboard Business Cards Away! Up to 320 characters, now supporting multi-part LONG SMS 🙂. In case your business card contains more info than could fit into the character limit, the additional details could be placed into an additional web page as part of the V-card via our Short URL APP, also provided within the ProTexting platform (FREE of charge). Our Messaging Short URL provides amazing tracking of who and when clicked on the link, so you can follow up with your clients and leads. 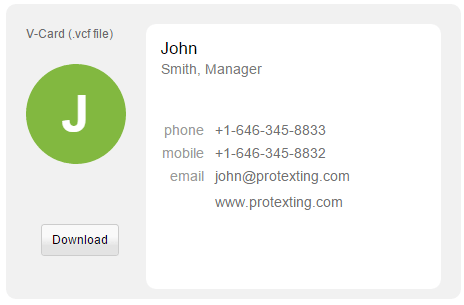 By setting up your business card, or your team’s business cards, in your ProTexting account, you will be able to easily manage, make changes quickly, and stop wasting money on printed cards. This great service has been utilized by many companies, and it is one of our top products!